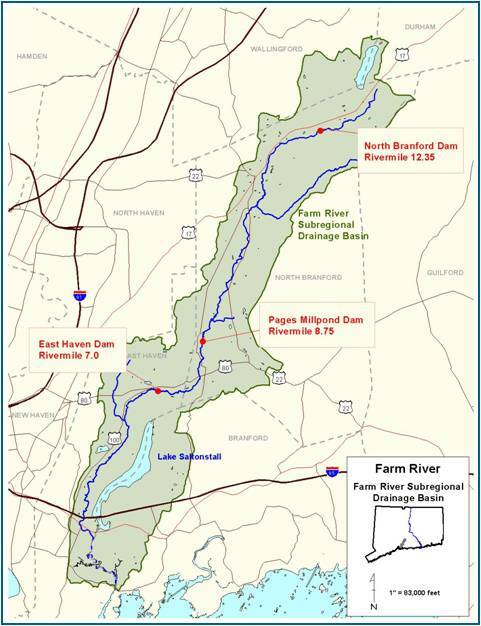 The Farm River drains a 26.6 square mile watershed in the South Central Coastal Drainage Basin of Connecticut, entering Long Island Sound (LIS) in East Haven, and several miles east of New Haven Harbor. The river is a source of public water supply for the South Central Connecticut Regional Water Authority (SCCRWA) and currently supports native brook trout and wild brown trout in the upper reaches, as well as diadromous fish, including sea-run brown trout, alewife, blueback herring, sea lamprey and American eel in the lower sections. This stream has one of the largest populations of wild trout for a Connecticut coastal river and has been targeted by the CT DEEP Inland Fisheries Division as one of the best opportunities to establish a run of sea-run brown trout at the same time as developing the existing river herring runs into significantly larger runs. The land along the river is relatively lightly developed, especially considering how close it is to the New Haven urban area and the habitat is in good condition. The Farm River drainage area includes the towns of Durham, Wallingford, North Branford, North Haven, and East Haven. Two dams prevent free passage of fish from LIS to spawning habitat in the Farm River system. These dams also limit movement of wild salmonid species within the river segments. These dams are both privately owned. The dam closest to LIS at river mile 7 is owned by the SCCRWA. 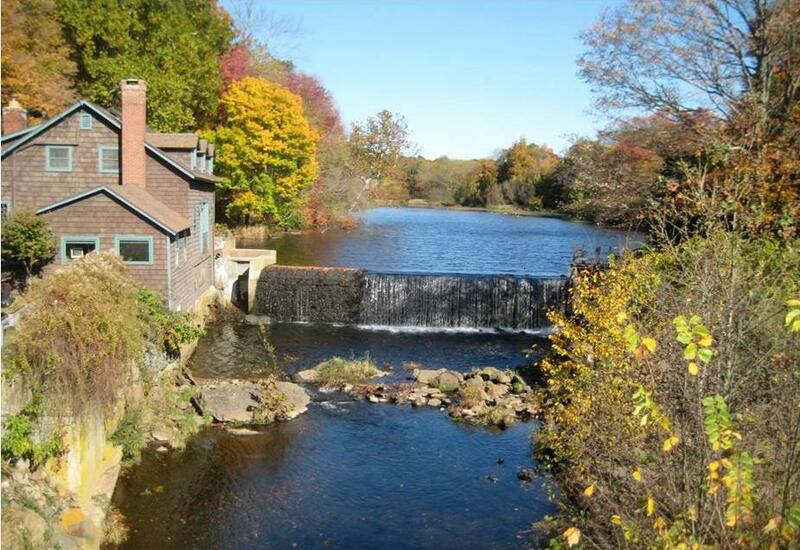 This dam, known as the East Haven Dam (EHD), diverts water into Lake Saltonstall, one of the public water supply reservoirs managed by the SCCRWA and thus is not a candidate for removal. The EHD is approximately 2 feet high and blocks free passage of fish at many river levels. The second dam upriver of LIS is the Pages Millpond Dam (PMD) at river mile 8.75. This dam is owned by the Suter family and is a historic mill dam. The PMD is approximately 10 feet high and creates a headpond of approximately 4.25 acres. The PMD is integral to the residence of the owner and creates a freshwater pond that is potential habitat for spawning diadromous fish. Removal of this dam is likewise not an option. A third dam exists at river mile 12.35. 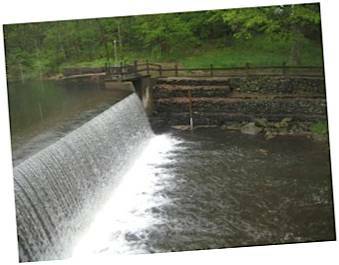 This dam has been determined by the Inland Fisheries Division of the CT DEEP to be at a point in the watershed beyond the historical range of the anadromous fish and therefore does not require fish passage. This project will benefit the fish species that utilize this river as spawning habitat, especially river herring, and other species endemic to this river system including wild brown trout, sea lamprey, and American eel. Additionally, the species that prey on the river herring will benefit including Striped Bass in LIS and in their migratory region. 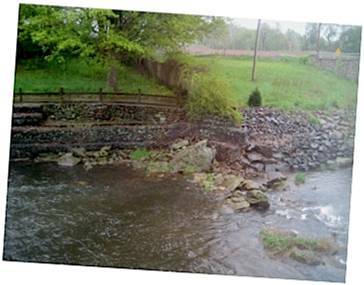 The overall goal of the Farm River Fish Passage Project (FRFPP) is to restore free passage for migratory and resident fish populations throughout the 12.35 river miles below the North Branford Dam by installing fishways in each of two dams. 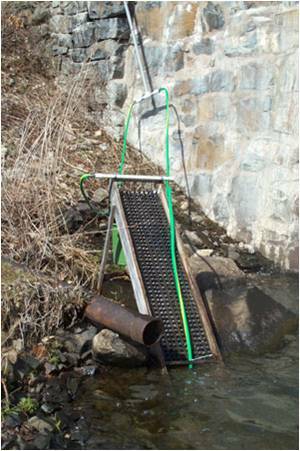 Success will be the installation of the two fishways resulting in increased resiliency of anadromous fish species, including river herring, alewife, Alosa pseudoharengus, and blueback herring, Alosa aestivalis , sea-run brook trout, and sea lamprey that will utilize the newly available spawning habitat. This additional habitat availability will result in increased recruitment thus buffering these species to potential perturbations of their regional habitat caused by storms such as Sandy. The FRFPP will also restore habitat connectivity for multiple resident salmonid species. American eel passage is also proposed and has been incorporated in the final design plans now complete for the Pages Mill Pond Dam fishway.